I consume literature, movies, TV with the absurd idea that I can learn from others’ misfortunes how to anticipate and avoid them in my life and the lives of those I love. Ha! 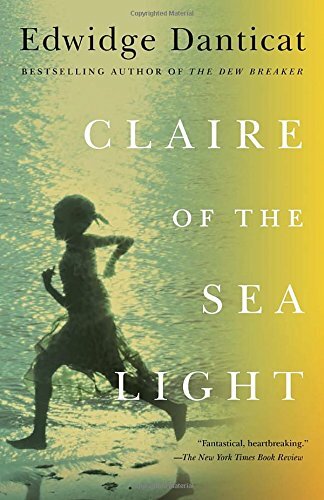 With Claire of the Sea Light, I hoped from the beginning to turn the tides against what Danticat presents as the sad outcome. I mean, it could happen, right? All could be well? But it’s Haiti, and things are hard. People are poor. Many suffer. Yet the impoverished life of Claire and her father Nozias seems sufficient for happiness, shining with the light of the sea and shore, a roof overhead, food and love. Their village has its dramas and secrets. Most have tragedies to color their lives. Claire, seven years old, knows only what she knows, and that is the obvious necessity of her life with her father. Danticat’s prose swells and shines, pulling us into and through the Haitian milieu. The sea light is a presence throughout, beautiful but fierce, comforting but unyielding. Nozias and Claire live in this light, but Nozias, unlike Claire, feels bound to search for the better life–if not for himself, at least for his daughter. The only way she can fight back is to disappear. In leafing through this novel to write this entry, I felt ready to read it again right now, to remember the details more clearly and savor the moments when the currents yielded a moment, letting the narrative, the reader, the characters, rest, look around, absorb the beauties and realities, before being pulled again, away from what? toward what? This novel was a New York Times Notable Book and named one of the best books of the year by The Washington Post, The Boston Globe and NPR. Edwidge Danticat has written 5 novels and was a MacArthur Fellowship recipient. Emily Dietrich is a poet, novelist, and mystery writer. How insightful you are. That is one of my favorite books. Who Is Crowned Ms. Morality: Teresa Giudice or Paris Hilton?